Our presentation at the All Ohio Counselor Conference is completed, generally successful, some wanted us to use the microphone, but the one’s who moved up to hear reported being pleased with how they spent their hour. One way or another, the deal is done and we have one more chance to stuff something down our gullets before heading back north. The Irish fare at Fadó worked well, we decided to stay with options we don’t have access to so easily at home and strolled into Café Istanbul. The folks seem very nice and willing to share a cuisine unfamiliar to many, almost like going to a friends house for dinner in high school. Just weirder food. 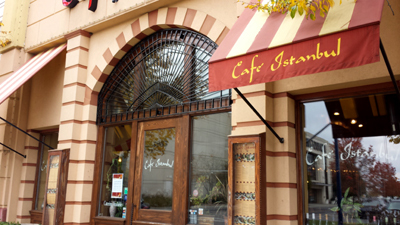 Much like the rest of the Easton area, Café Istanbul is much nicer inside than you would expect for most storefront restaurants, particularly those featuring something like Turkish cuisine. I suppose that is Easton, I typically expect something like the Greek place we just visited, rocky environs, typically really solid food. Everything here is bright and shiny, linens, glasses, staff. I started to worry, sometimes all of the buffing removes some of the patina that world cuisines have earned over time. For the most part, just like the rest of our trip, snazzy was met with turns between competent and impressive. 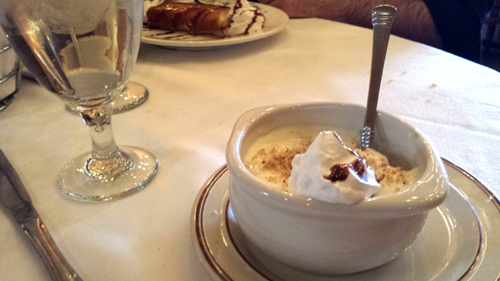 Five of us shared four appetizers, five entrees and four desserts. It still sort of amazes me how many folks throw in on our goofy little adventures. The presenter and a comrade from the session on trafficking we had attended the day before happily passed their plates around and tried a bit of everything along with us. I didn’t try one dish, I try hard to be polite, they were unfaultingly gracious, I still just hate to ask folks I just met. The lentil soup with garlic, celery, carrots and onion was probably my least favorite dish of the entire meal. Lacking some of the depth I would expect, it had an additional flavor, much like epazote (kerosene-like) I didn’t enjoy at all. A squeeze of lemon helped but not enough to consider ordering it again. 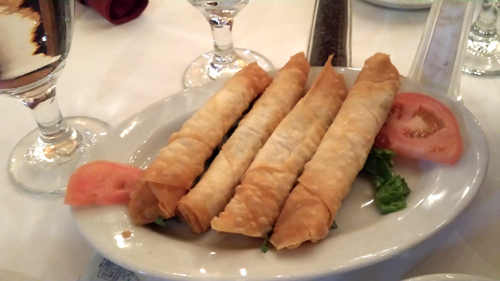 The other hot appetizer, Sigara BÖrek, is something I would order again and again. 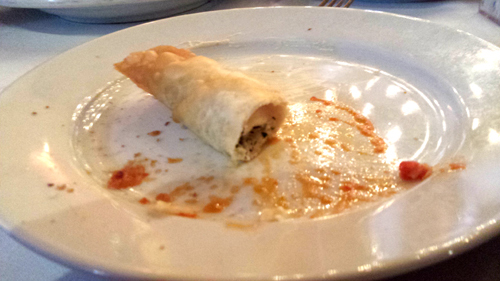 Crispy phyllo pastry cigars were filled with feta cheese and parsley. Simple, succulent, salty and fresh, that’s what we were looking for. We had considered trying the calf liver cubes sautéed with herbs and spices and topped with an onion/sumac combo, but there were enough sour faces around the table we decided to go another route. Our two cold apps were hummus and eggplant with sauce. I was surprised by the eggplant. 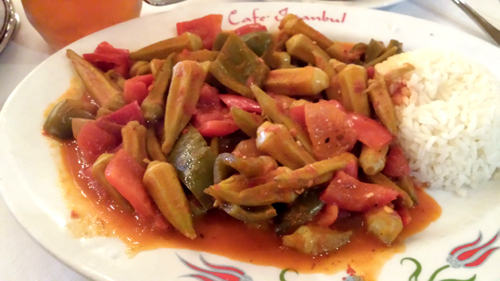 The veggie cubes are fried and then combined with red peppers, onions and garlic in their tomato sauce. I didn’t really expect it to be cold, when I discovered it was I didn’t expect to like it, I was wrong on both counts. If you have ever had pizza that tasted better out of the fridge than out of the box, that’s what this brought to memory. The chill seemed to amplify the eggplant and the veggies in the sauce, all of which had been metered to a sublime balance. 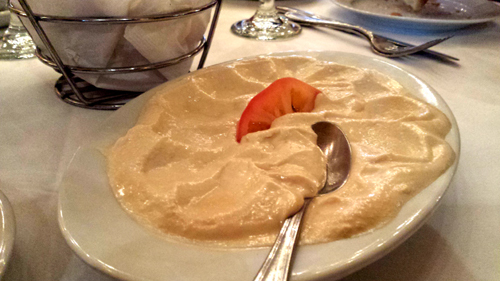 Their hummus is chickpea central with a little garlic, sesame, lemon and olive oil. What made it stupid tasty was the texture, almost as if it had been whipped, nearly cloud-like in smoothness, I want to know exactly how they achieved that particular feat. 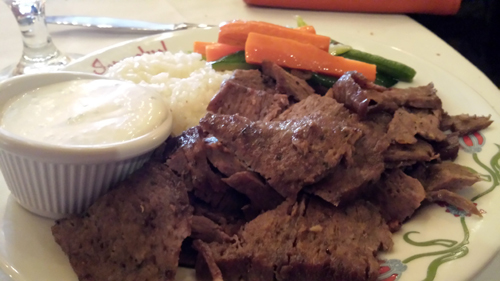 The entrée I didn’t try was the Döner Kebab, carved gyro (lamb and beef) meat with rice, sauce and a little veg. It looked like what you would expect. The side of vegetables were done with respect on all of the dishes. Not raw, not baby food, warm through with a just enough crunch remaining. All is right with the world. Our southern compadre violated one of my rules. Namely, no okra that is not obliterated or fried. I have never been able to get over the snot. Wrong again. The pods in this dish were tiny juvenile buggers which seemed to emerge without the boogers after a sauté with onion, garlic and tomato sauce. 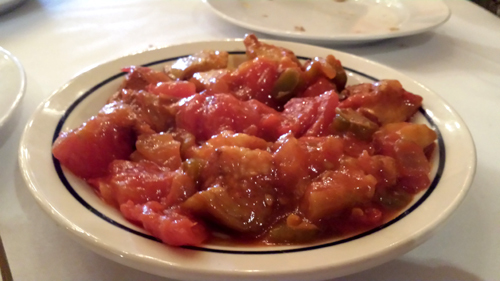 Similar to the mix on the eggplant, turns out its tasty hot as well. We also had a chicken sauté with similar vegetables and I think you could put almost any protein or no protein into this aromatic and spiced sauce and end up with something enjoyable. 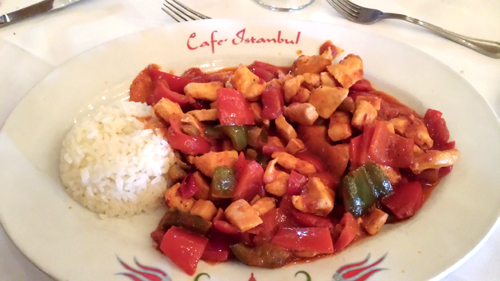 The Mousakka and the Karniyarik entrees featured similar ingredients in different formats. Both were excellent. 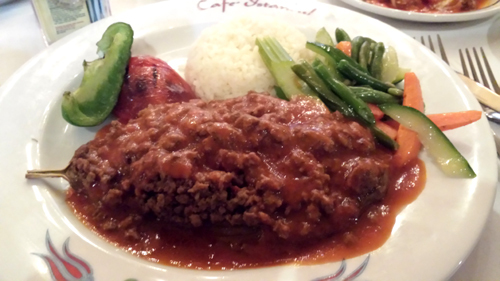 The Karniyarik was a stuffed eggplant, loaded with ground beef and lamb with chopped tomatoes, peppers and herbs. Rich and wonderfully seasoned, these sorts of dishes make me sad for folks who are averse to trying different people’s cuisines, the things they’ll never experience. 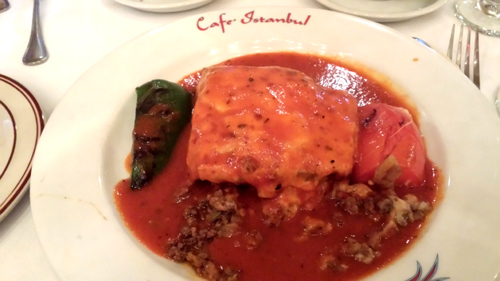 The Mousakka is the same meaty stew, this time layered between slices of eggplant like a lasagna. The difference flavor-wise here is the addition of a béchamel and mozzarella cheese. The two dairy components made the dish ever richer and added some additional nose and taste from cinnamon and other spices. Delicious. 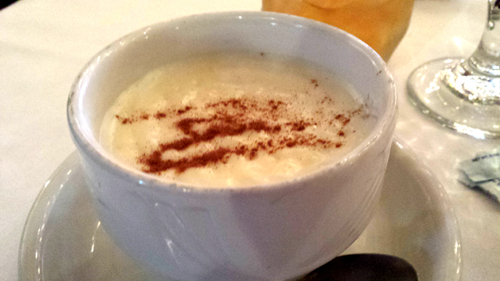 Two of the entrees came with a complementary Sutlac or rice pudding which was nice enough. Set so thick, I think if you smacked it to see if it jiggled, it might slap you back. The dusting of dark cinnamon helped the lightly sweet mixture but two of the other three desserts would blow this cup clear from the sea. 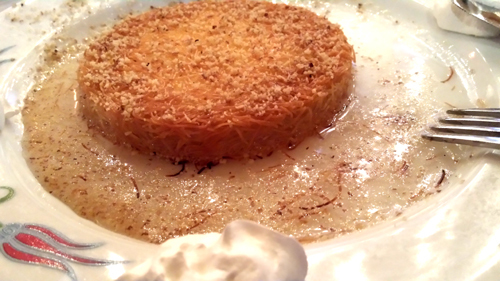 We tried Kazandibi, a homemade milk custard topped with cream and grape sauce. The sauce was interesting but for me the custard was so stiff I had trouble enjoying the whole thing. I am usually not a texture guy but there was just something about this wiggly log that didn’t work for me. Keskul, the homemade almond pudding topped with almonds and cream achieved what the rice concoction could not. The nuttiness added needed flavor and the whipped cream atop allowed you to loosen the thick set custard a bit and enjoy the almonds. 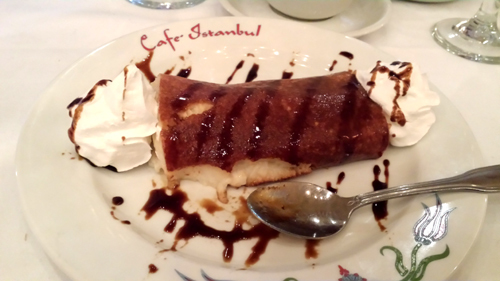 The most surprising was called Kunefe. As soon as I saw it on the menu I knew we would be trying it. It didn’t look like what I expected, I’m not sure what I did expect it was just different. 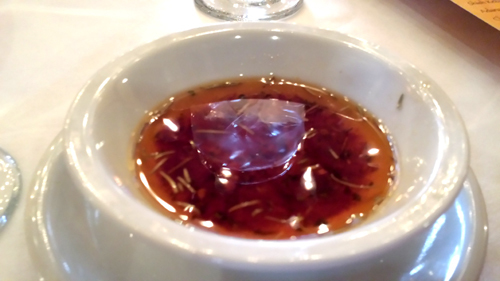 A hokey puck of baked shredded phyllo dough was resting in a clear and sweet sauce, which was studded with what look like saffron threads. Don’t see a lot of that stuff in desserts. What’s another thing you don’t see often in desserts? Hmmmmm. Oh yeah, goat cheese. The hockey puck is stuffed with a sweetened goat cheese. All together you have a heady clear broth with definitive notes of honey, crusty brown crispy shreds of dough and just enough sweet to notice against the hefty tang from the cheese itself. So strangely scrumptious. Makes me even more sad for overly cautious eaters.